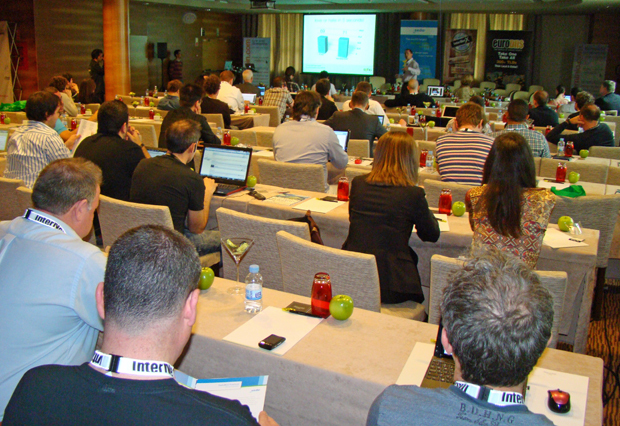 The Domaining Europe 2012 conference ended Saturday evening (April 28) in Valencia, Spain with the 4th event in this series winning rave reviews from every attendee we spoke to. The sell out crowd came from 23 different countries around the world. Show founder Dietmar Stefitz of Inverdom.com co-promoted this year's event at the four-star Hotel Sorolla Palace with the invaluable help of veteran conference producer Jodi Chamberlain. My last post from Spain covered the show's opening day. In this post I'll pick up where I left off giving you the photos and highlights from day 2 Friday as well as the closing day Saturday. Mr. Stefitz kicked off a full day of business sessions Friday morning with welcoming comments to his guests from around the world (many remarked that Dietmar treated everyone as if they were guests in his home, not just people who came to a business event he happened to stage). Stefitz noted the family atmosphere that prevails in the domain business and he urged the successful domain investors and developers in our space to share their wealth of knowledge with newcomers who will help the industry grow and continue to prosper in the years ahead. 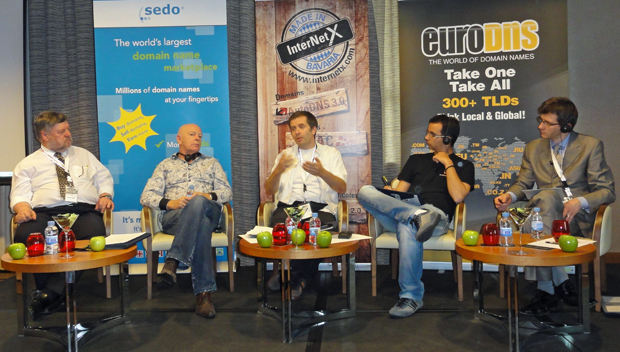 One of the world's top domain attorneys, Paul Keating of Law.es, who maintains offices in Barcelona and London, was on stage next with a very informative discussion of the risks involved in domain name investing and how to manage them. Keating also discussed efforts in the U.S., Europe and other territories to get policy or even laws changed in a way that would make it easier for over-reaching trademark interests to take away domains they are not entitled to. 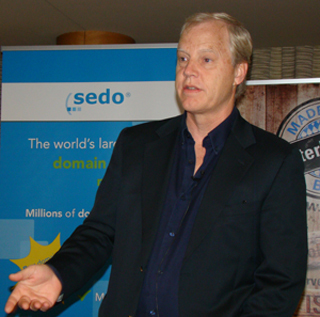 Keating noted that all domain owners need to help fend off attempts to take away their rights. At the least you should contact your government representatives when unfair laws are proposed (and ICANN when proposed policy changes could usurp your rights). legal issues and domain investment risks. 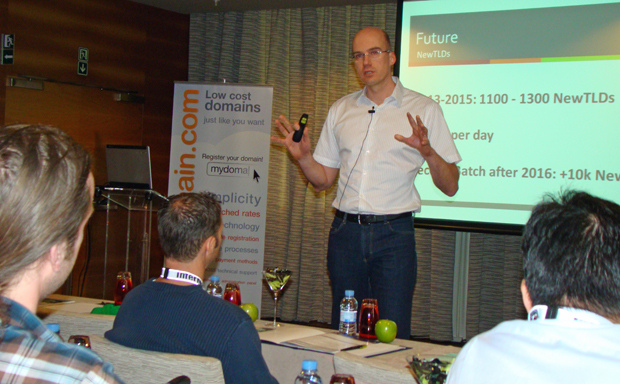 At 11:30am EuroDNS.com Founder and Chairman Xavier Buck delivered an excellent keynote address on Domains: Past, Present & Future. The highly respected Internet entrepreneur has founded many successful ventures including the DCL Group and several of its subsidiaries, including popular registrar EuroDNS, DomainInvest, Datacenter Luxembourg and eBrandServices. With respect to the future Buck predicted that between 1,100 and 1,300 new gTLDs will be active by 2015 with the majority of those (about two thirds) representing brand names. He thinks that domains related to places (such as city geo domains) will be among the most successful with generic terms less so). Buck also forecast that by 2020 1 billion domain names will be registered across all extensions (five times more than the approximately 200 million that are currently registered) - and again he thinks widespread use of new brand name extensions will play a large role in the registration boom . 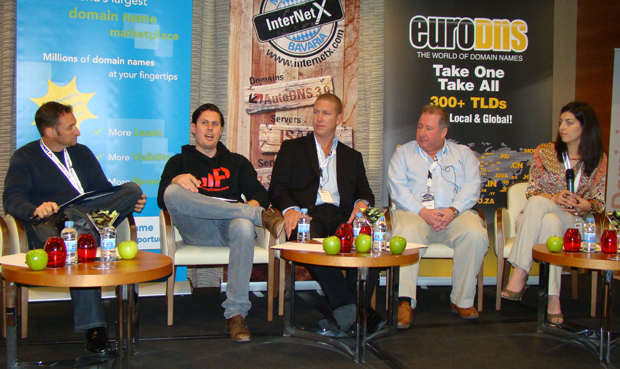 With booming growth continuing for the Internet he said the future of the domain aftermarket looked very bright. Alvaro Añon, a leading expert in website usability, UX and persuasion followed with some great advice on those topics for website developers. Añon spoke in Spanish and thanks to an excellent headphone translation system available at the show, all attendees could understand what was said whether it was in Spanish or English. A view of the crowd listening to Alvaro Añon's presentation Friday afternoon, April 27. In a logical follow up to Alvaro's talk about improving website interfaces, Braden Pollock of Legal Brand Marketing moderated a panel discussion on the ever popular topic of whether it is best to Park or Develop domains. Tommy Butler (Glasgow.com) and Estrella Moreira (NameDrive.com). Pollock, a lead gen whiz who noted the discussion would also include alternative monetization platforms such as his specialty, said the topic might just as well have been titled Adapt or Die! While panelists like Tommy Butler are strongly pro development, Boshoff cautioned the audience, noting, "You're a domainer, if you are going to develop you had better be prepared to run a business and it is tons of hard work." 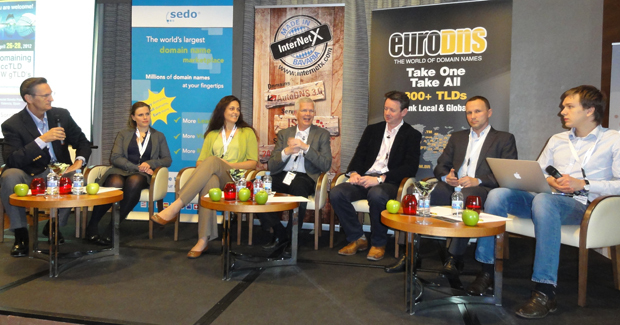 I moderated the next session but not much moderation was needed as it was essentially an open discussion of developments in both ccTLDs and gTLDs. Each panelist was invited to comment on trends in the categories they specialize in. Arthur Piechocki (NASK, the .PL Registry), Sergey Gorbunov (RU-Central). 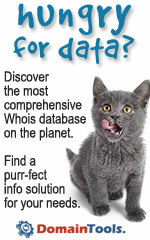 I asked Helena Neidermaier, who handles international business communications for fast growing regstrar InterNetX.com, how registrars such as hers will decide which new gTLDs (of the hundreds expected to come online) will get the limited shelf space registrars have to offer their customers. She said market demand will dictate which ones are given space at InterNetX and which will be left looking for another registrar home. AnnaLisa Roger, whose organization has applied to run the .green registry is understandably a proponent of new gTLDs, as is Ken Hansen, whose company also runs the .US ccTLD. Neustar has just launched a new promotional campaign for .US and Hansen believes the American country code has a lot of upside. In Nominet, Kingsland represents the administrator of one of the world's most popular ccTLDs in Great Britain's .co.uk and he expects the extension to remain dominant in the UK, regardless of what new gTLDs are introduced. Arthur Piechocki and Sergey Gorbunov talked about the rapid growth in their respective favorite ccTLDs; Poland's .pl and Russia's .ru. Friday's final panel discussion offered the expert's forecasts on The Next Five Years in Domaining. Development Fund), Joan Riera (DonDominio.com) and IT attorney Jorge Campanillas. 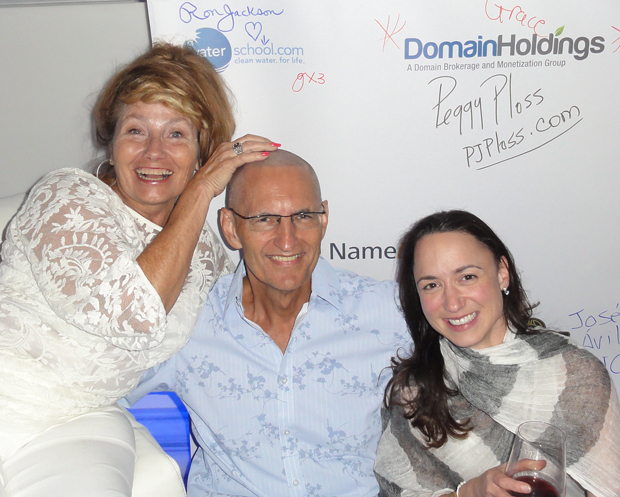 With respect to where to make money with domains over the next five years, Gregg McNair, Chairman at PPX International, said to look toward alternate monetization options, noting that his company made an early move toward CPA (cost per action) and has done very well with it. He also said that rather than debate whether new gTLDs are good or bad, investors need to find a way they can cash in on the impending new gTLDs (that would not necessarily mean buying new gTLDs but might include offering services to those who do). He said so much money will be thrown at that category that it would be crazy just to sit and watch the parade pass by. Before the agenda moved into Friday evening's special events, executives from three leading companies presented updates on the latest developments at their firms. Daniel Eisenhut (EuroDNS.com) and David Thorpe (Sedo.com). That was the final business session of Domaining Europe 2012 but there was still much more to come as the sun was setting. Gregg McNair, a long time supporter of The Water School, a life saving organization that is bringing a disease eradicating low cost clean water solution to the developing world, kept the crowd spellbound with a presentation about The Water School's work. 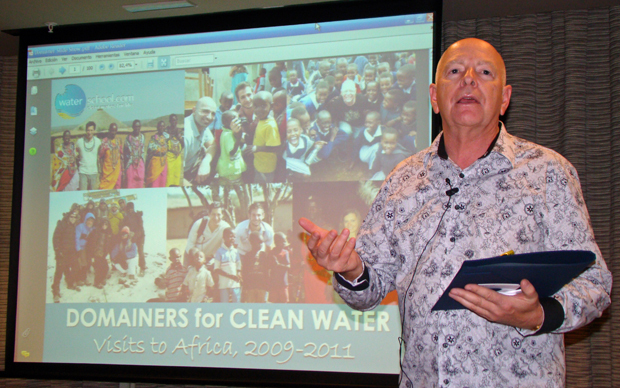 Noting that 1.5 million people die annually from preventable diseases in Africa alone (the vast majority of those being children), McNair left the audience with a clear understanding of why The Water School cause has been adopted by so many in our industry. He said that nearly half of funds raised for The Water School's program has come from the domain industry. Gregg McNair gives European domainers an up close look at The Water School's work. A little before 8pm, the Domaining Europe Awards were handed out by awards committee chairman Chisco Santibañez (an attorney who also co-produced the first three Domaining Europe conferences) and show founder Dietmar Stefitz. 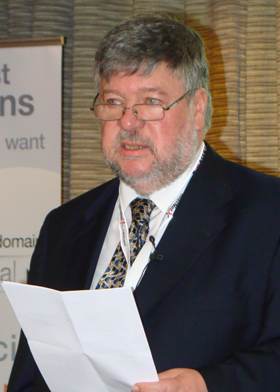 The first winner was Harry Ebert who took home the National Domain Award for Spain. 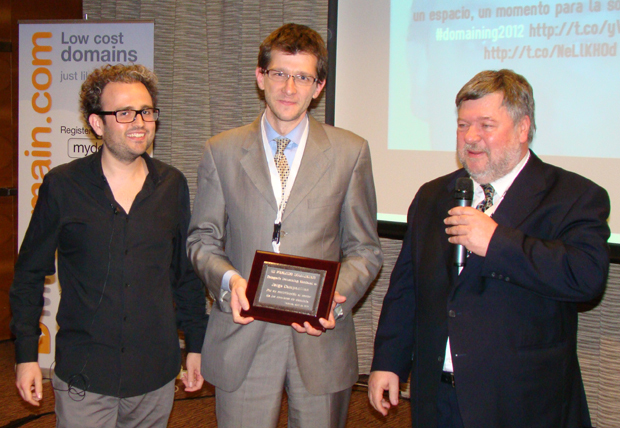 Next the European Domain Award went to Nico Zeifang of ParkingCrew.com. The third honoree was attorney Jorge Campanillas who won the National Spanish Domaing Award. the Spanish National Domaining Award to Jorge Campanillas. Two international awards followed with noted attorney Paul Keating, who has offices in Barcelona and London, being named winner of the International Domaining Award, then, in a complete surprise to me, I was called up to receive Domaining Europe's first award for International Communcations in the Domain Industry. I was even more surprised when organizers followed the award with a video featuring a Who's Who of the domain business congratulating me on the award and sending their own personal messages that were very moving to both Diana and I (you can view that video below). Ron Video 04192012 from Kent Bryan Blanche on Vimeo. If you watched the video above you can understand why I wuold be so moved by hearing those sentiments expressed by so many people I have such respect and admiration for. I learned that Jodi Chamberlain had been working on putting it together for months and had conspired with many other people to get me to Spain so they could spring the award and video on me (I also learned that my wife Diana knew it was coming for months but never let the secret slip). 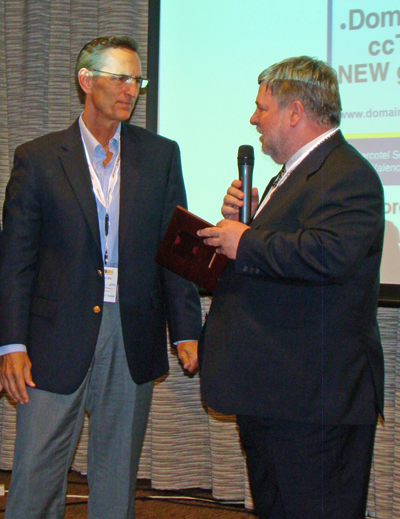 Ron Jackson (DNJournal.com) receiving Domaining Europe's Award for International Communications in the Domain Industry from conference founder Dietmar Stefitz. I want to thank those people and companies for the roles they played including (in alphabetical order): Above.com, .CO Registry, DomainHoldings.com, DomainAdvisors.com, Escrow.com, attorney Karen Bernstein, Nico Zeifang (and his ParkingCrew.com who produced the cool animation at the end of the video), Neustar and Sedo.com. Of course, I also want to thank everyone who took their time to appear in the video and touch my heart in the way that you did - making me both laugh and cry during the 11 minutes it ran. When I get back to the U.S. I will be contacting each of you with a personal note of gratitude for your friendship and support. Just as I thought my evening had ended on a triumphant note, Gregg McNair called back onstage and quickly cut me back down to size (literally). 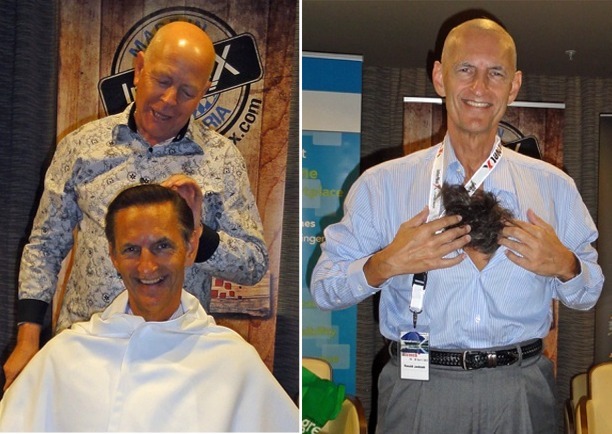 As I wrote about prior to the show, Gregg McNair has been on a campaign since DOMAINfest Global in February 2012 to get me to let him shave my head as part of a campaign to raise $50,000 for the Water School. 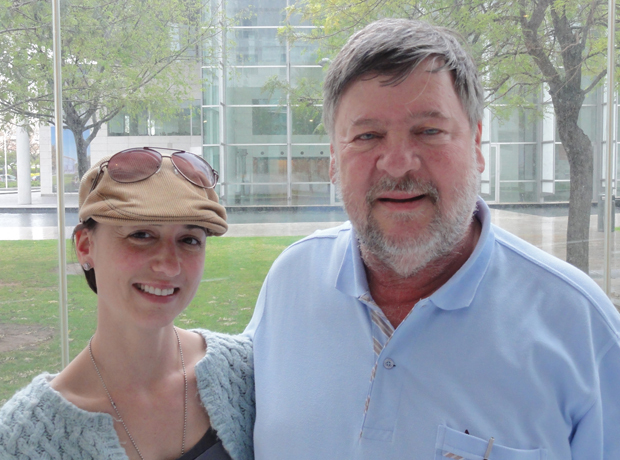 It all started when Gregg, Jan Barta (ElephantTraffic.com) and I were chatting at a dinner one night during that show. We were talking about three good guys (Vern Jurovich, Jeff Gabriel and Bill Lozada), who would end up having their heads shaved later that night by McNair in exhange for pledges to the Water School. Barta suddenly blurted out that he would pay $10,000 if I would let McNair shave my hair off. Frank Schilling (InternetTraffic.com) got wind of it and matched Barta's $10,000 offer for my scalp, suddenly putting me in the hot (barber's) seat. McNair chased me all the way to Valencia, Spain where I finally threw in the towel - only to have it draped over my shoulders Friday night while McNair gleefully ran his electric clippers across my head - much to the amusement of the Domaining Europe audience. along with my attempts to avoid crossing paths with McNair the past few months). On another very positive note McNair told me that the donations after the scalping had pushed total collections past $40,000! ParkingCrew.com kicked in about $4,500 after offering a $150 donation for every person who wore a Parking Crew T-shirt to dinner that night. They quickly ran out of the 30 or so shirts they had on hand. Also, Toby Clements and David Clements stepped up immediately after my hair had been cut and cut checks totaling $2,000 ($1,000 from Toby on behalf of TobyClements.com and $1,000 from David on behalf of Brannans.com). Thank you to all who donated to the Water School! When I get home I will get more information on donations from Gregg so I can recognize others who gave. Anyone can make contributions at WaterShave.org. Friday night ended with attendees treated to a great dinner at the Red VLC restaurant. In Spain dinners are typically served at 10pm (as this one was) so the evening ran until after 1am when Diana and I finally turned in after a day and night I am sure we will never forget. Domaining Europe 2012 closed Saturday, April 28 with a great leisure networking day centered around a trip to the Vicente Gandia company's Hoya de Cardenas vineyard and winery about an hour west of Valencia. We were transported there in two luxury buses that gave us a great view of the Spanish countryside en route to our wine tour (and multiple tastings). 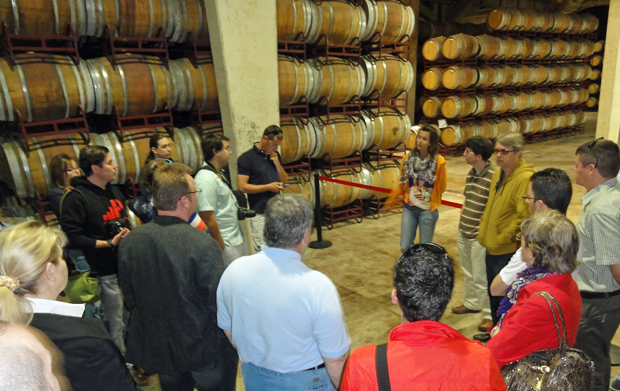 Hoya de Cardenas winery near Utiel, Spain Saturday (April 28). Our tour started in the champagne cellar at the winery and progressed to a champagne tasting, then a tram ride to the historic home at the center of the vineyard where the wine tasting room is also located. There we got to try the vineyard's latest white, red and dessert white wines. Jim Grace (DomainHoldings.com) at far right was among those enjoying the wine tasting. 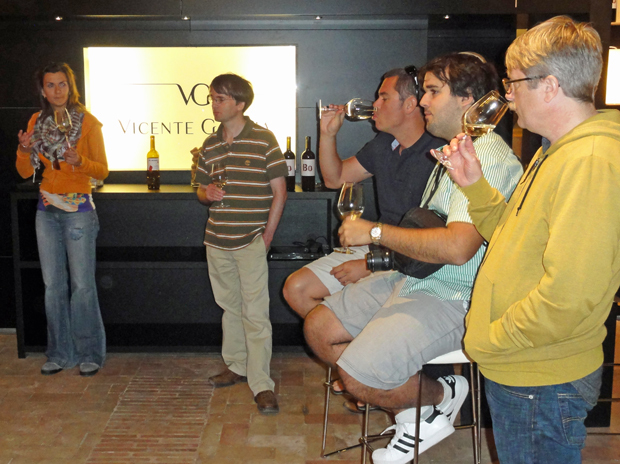 The wines were very good and in Spain they are incredibly inexpensive. The price for bottles of a good red wine in the Hoya de Cardenas gift shop started at just €3.50 (under $5). As you might expect, the domain industry visitors burned up the cash registers in the gift shop (Dietmar Stefitz took home several cases himself). After our tour of the winery we were taken to the village of Utiel where we were treated to lunch at the El Tollo Hotel and Restaurant. Most of us had the traditional Spanish dish paella that originated in Valenica. We were also served more wine. In Spain wine is as common on the table as iced tea is in the U.S. (actually more so). I was going to crack my bottle there and share it but, alas, could not find a corskcrew big enough to get it open. their way back home (or already there) but Diana and I are staying over in Valencia until Monday to see more of this delightful city. We will take a lot of fabulous memories home with us, with the hospitality that show producers Dietmar Stefitz and Jodi Chamberlain showed us and all of the Domaining Europe 2012 guests certainly among the best of them. Muchas gracias Dietmar y Jodi y viva España! and Dietmar Stefitz at the end of a very successful conference.